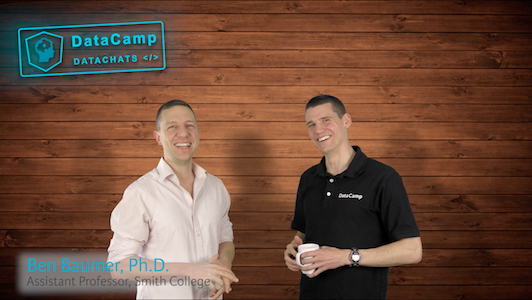 Episode 8 of DataChats: Ben Baumer, Assistant Professor in the Statistical & Data Sciences Program, at Smith College talks about his path to teaching and data science. In this episode, we interview Ben Baumer. Ben is an Assistant Professor in the Statistical & Data Sciences Program at Smith College. He completed his Ph.D. in Mathematics at the Graduate Center of the City University of New York in 2012. He is an Accredited Professional Statistician™ by the American Statistical Association and was previously the Statistical Analyst for the Baseball Operations department of the NY Mets.